Hi, my name is Trenton Kozel and I am a senior and drum major at my high school. I just wanted to email you to let you know that you and everyone at System Blue have forever changed my band for the better. I attend a small school of only 650 students called Orcutt Academy High School. My freshmen year, the band there only had around 10 people and we didn’t even have a director the first week. We had to practice each morning during zero period from 6:50 to 7:50 and share our classroom with regular-ed teacher. The next year, we had 14 and got to practice during first period, but we were in an old storage closet. The following year, we grew to 19 and finally had an actually room which we only shared with the neighboring junior high band. Overall, we have been struggling a long time- but growing and improving nonetheless. 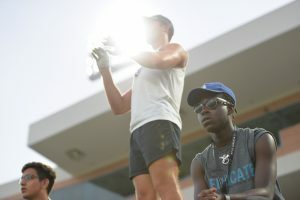 The summer before this year, my director told me that we were going to have around 27 students and that we could finally bear to sacrifice a member of the ensemble for a drum major. I had always been a sort of unofficial drum major and leader in our band, but I was one of only two trumpets which are pretty crucial to the melody of most of the pop tunes we played. I was excited, but I didn’t know how much we could change and improve until I went to System Blue. That summer, my director convinced me to go to the System Blue Leadership Camp at Grand Terrace. Honestly, at the time, I was pretty bummed out. I didn’t know what to expect, it was in one of the first weeks of summer, and it was almost a four hour drive from our city. To my surprise, however, it was extremely worth it. At System Blue, you, Ben, Kyle, and Kristen gave me the knowledge and know-how to make my band better than ever. This year, my band has cleaner rehearsals, section leaders, a drum major, and more respect in everything we do. On top of that, we had the first ever band camp in our school’s history, and this Friday, at our football game, we are marching drill for the first time in our school’s history. In the words of my school principal, parents, and community: we are a real high school marching band. We have improved a lot, but we are not stopping here and we hope to try to put on a show and compete next season! Thank you for teaching me how to be an effective leader and giving me the motivation do something with that knowledge. Because of System Blue and this year in band so far, I want continue music my entire life and even be a band director! All in all, I want to thank you guys because you deserve it. I, along with my director and my band, extend an enormous thank you to you, the Blue Devils, and everyone who puts on System Blue for helping me help my band. Seriously, thank you. You guys put on an amazing camp that changes lives. Needless to say, I promote it with all my heart and my band will continue to send people to learn as I did. P.S. Sorry this is so long and if you could share or forward this to Ben, Kyle, and Kristen that would be great!